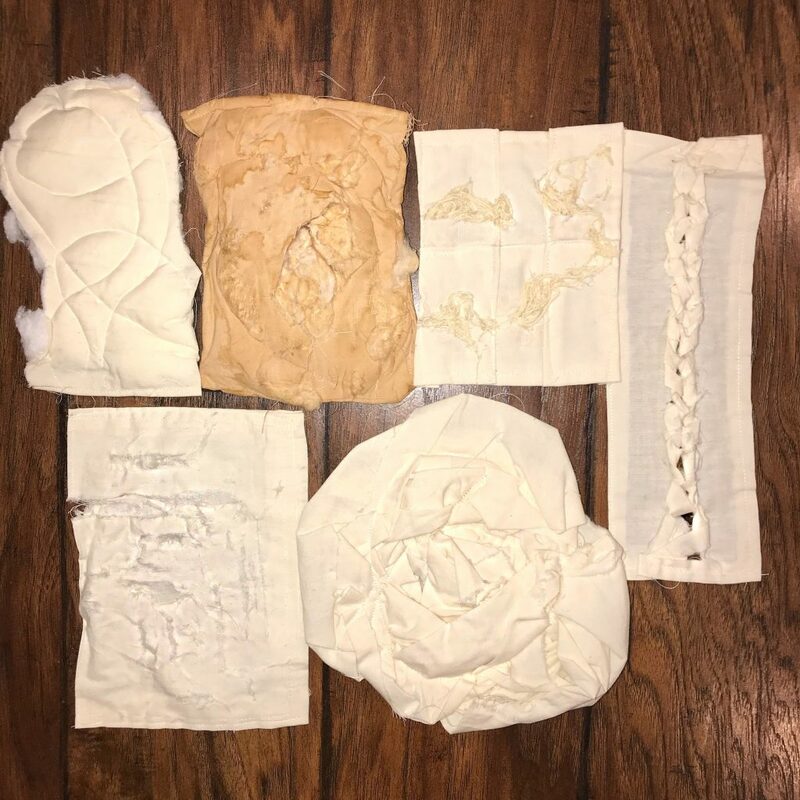 My first fabric manipulation was inspired by the pack of Top Ramen. 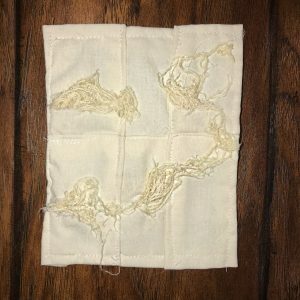 I sewed string in-between two pieces of muslin, and then continued to rip them out from inside. I continued to section off the holes to create several “packets” with “ramen falling out”. 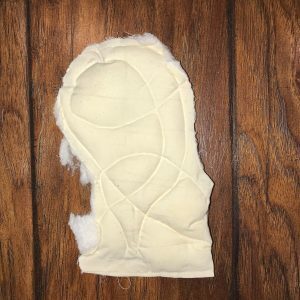 This next fabric manipulation was inspired by the picture of my shoes. 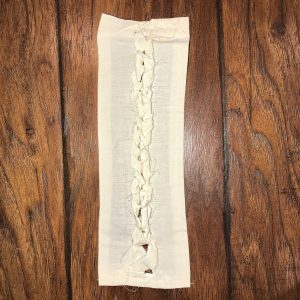 The braided muslin going up resembles all of the shoe laces on my shoes. This fabric manipulation represents my coffee/coffee cup. I tea stained the muslin to create these splotchy stains all over the fabric, which were also sticky. 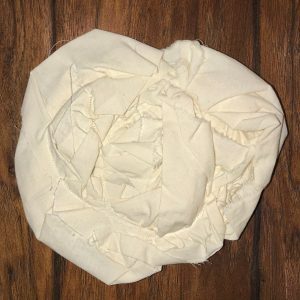 I then quilted and distressed the muslin to create a sort of mess, which is a representation of how our mornings feel before our cup of coffee. 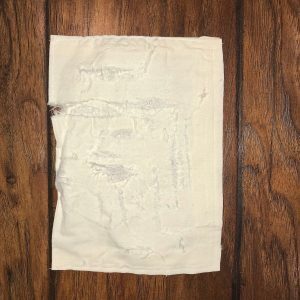 This distressed piece of muslin is supposed to represent the bottle of toothpaste, and what would happen to our teeth if we did not have this necessity. I used both an xacto knife and sandpaper to create this texture. I cut out this fabric manipulation to match the same position of my mother’s head in her drivers license photo. I continued to quilt it freely by not maneuvering it with my hands because of her huge, crazy hair in the picture. Lastly, I created this fabric manipulation to represent the view from my bedroom window. I wanted this manipulation to represent a flower because of how beautiful I find my view overlooking the financial district. 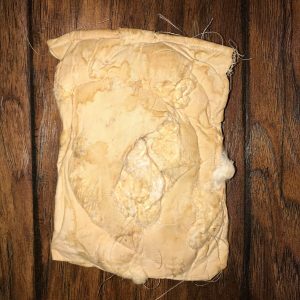 I scrunched the fabric together and continued to sew all around it. Throughout working on our beauty collections, I found the seminar readings helping me see beauty in different ways. These readings also further enhanced by already established beliefs on beauty. I learned that beauty was more then just something that was pretty, beauty can be something that is helpful to our lives. This inspired my whole collection, which showed the beauty in everyday items taken for granted. Without these, our lives would be very different, and much harder. 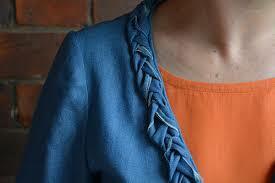 One fabric manipulation that I used in my collection was braiding. I really like this fabric manipulation because of its simplicity. I find the manipulation very easy to do, while looking very nicely used. I envision this manipulation being used going down a sleeve, side of pant, or bag. In this design, the braiding is a huge, if not the most important part. Without, it would just be an average blue jacket. It adds a sense of personalization and design, while still keeping the garment simple.